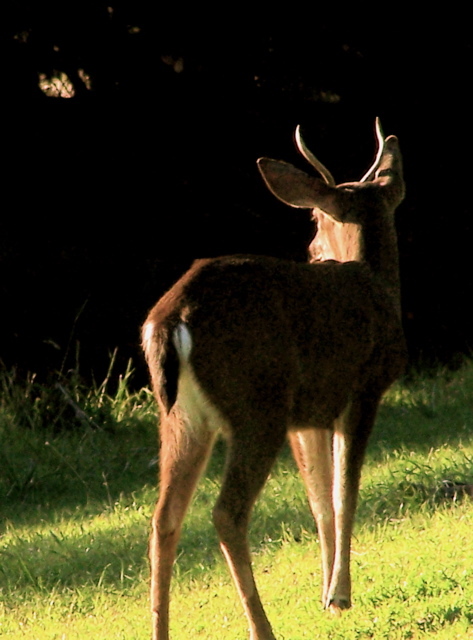 A blacktail buck in the glow of late afternoon sun as the days grow short. It was one of those moments when reality becomes surreal — as if the natural world suddenly went running off in all directions. Which is sort of what happened. As I was about to leave my cabin to get my mail at the post office, something told me this would be a good day to carry my camera in my pocket. So I did. Nothing happened downtown worth photographing, but when I was driving back up my long, curved driveway, I was suddenly glad to have my camera with me. 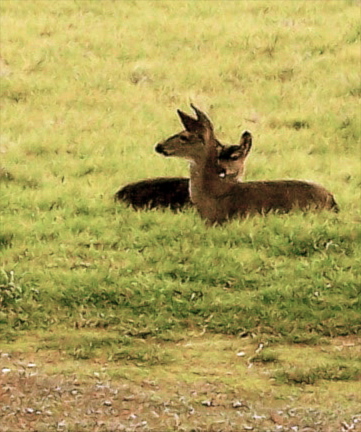 Near the top of my driveway, I startled a herd of blacktail deer grazing just downhill from my cabin, and they did what deer typically do in these circumstances. The herd ran in front of my car. I was proceeding slowly, however, so they safely made it into a field on the other side of the driveway where they stopped. 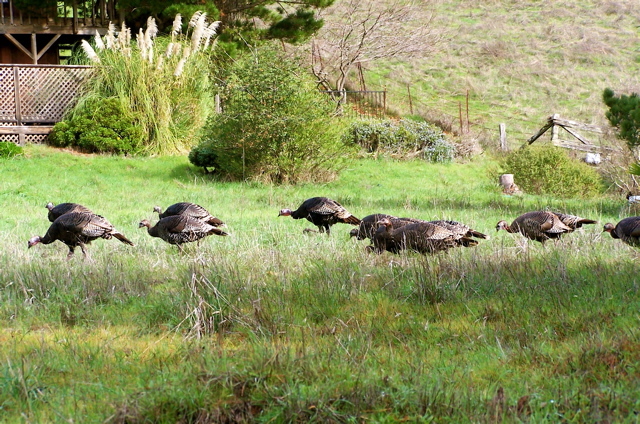 Wild turkeys hunt and peck their way across my field. As it happened, a flock of 12 wild turkeys were already in that field, and when they saw my car approaching, the turkeys just as perversely scurried across my driveway in the opposite direction. Both were so intent on where they were heading that the flock and herd dashed past each other without seeming to notice there was a discrepancy as to where safety could be found. A dozen wild turkeys forage downhill from my cabin. Once they’d passed each other on the driveway, bird and deer both slowed to a walk, and I was able to photograph the turkeys as they marched across the field below my cabin. Wild turkeys are not native to California. In 1988, California’s Department of Fish and Game planted three toms and 11 hens for hunting at Loma Alta Ranch (on the ridge between Woodacre and Lucas Valley Road). 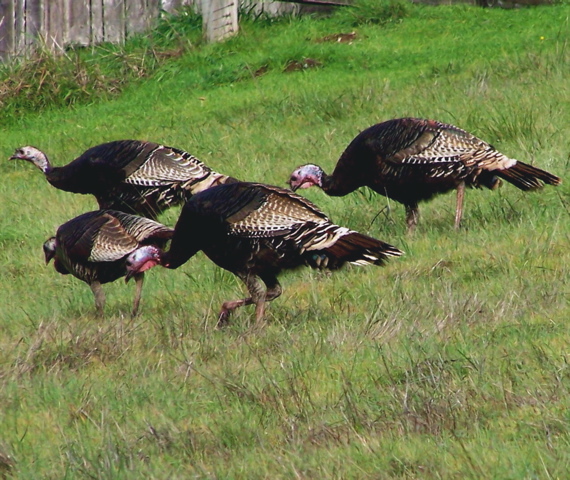 From there the turkeys spread to nearby Flander’s Ranch and the Spirit Rock property — and eventually to Nicasio, Olema, and even as far north as Tomales, where they have been known to intimidate small children and scratch the paint of cars on which they perch. In February 2005, a low-flying turkey gliding across Highway 1 in downtown Tomales hit a power line, causing three lines to slap together and fall to the ground. The town was blacked out for four hours, but the turkey — albeit initially stunned and walking around in circles — suffered only a few singed feathers and eventually wandered off. around her mother’s neck at the departing turkeys. WOW, that’s all I can say; you capture, the most beautiful colors of your dinosaurs and reptiles…..You live right in the middle of a wildlife sanctuary. Terry never even knew that there were all those snakes here. KEEP UP THE GOOD WORK. The people want to hear YOU, not Plotkin. He has NO clue how lucky he is to live in Paradise. He does not write about, nor show pictures of, our beautiful County. He writes (and I quote) how he has learned to pass cars in a hurry to get somewhere, and writes that he had one too many drinks but chose to drive drunk to Bolinas in the night. HE HASN’T A CLUE ON HOW TO RUN A WEST MARIN COMMUNITY, NEWSPAPER… HE HAS TO MOVE SOMEWHERE FAR AWAY FROM US, AND WE CAN ALL TRY TO FORGET WHAT HE HAS DONE TO OUR POINT REYES LIGHT. KEEP UP THE GOOD WORK OF BEING YOU AND SHARING WITH US, EVEN THOUGH PLOTKIN HAS TRIED TO STOP YOU. Sparsely Sage and Timely is powered by	WordPress 4.9.10 and delivered to you in 0.347 seconds using 52 queries.